Infiniti's luxury SUV, the QX56, isn't due to be replaced for a while, so they did what every manufacturer does during the wait: gave it a makeover. For 2008 there are just enough updates to set it apart from the outgoing model. The exterior makes do with revised front and rear fascias, new fog lights and chromed 20-inch alloys. There's more new chrome around the wheel arches, on the mirrors, roof rack and the side moldings. You'll need to check out the interior to catch the big news. There's extensive use of wood, aluminum and stainless steel along with leather-clad surfaces and high-quality vinyl and plastics. The center-stack surround is brushed aluminum with more around the shifter gate and steering wheel spokes. Seating surfaces and steering wheel rim are leather-clad and the interior as a whole is both attractive and tasteful. It also looks expensive, as it should on this class of vehicle. The folding 60/40 split 3rd-row seat is now powered and obediently lies flat to maximize cargo room. On 4x4s the steering wheel is heated and all models receive heated, power-folding outside mirrors with auto-dim and memory. The running boards are power-retractable and quarter windows also are electrically-powered. Front-row seats are heated and 10-way power-adjustable (8-way on the passenger side). Adjustable pedals with memory function are part of what Infiniti whimsically calls the "Auto Drive Positioner" memory system that also retains settings for outside mirrors and driver's seat. Also standard is a Burr-Brown audio system with 9.5-gigabyte hard drive and a compact flash slot for playing MP3 files. Optional is XM satellite radio with NavTraffic, realtime traffic updates. The standard satnav screen doubles as a monitor for the rear camera, which does an admiral job of depicting danger zones and objects at risk while you're backing. If the camera isn't enough, there also are sonar parking sensors in both bumpers to warn of imminent contact with foreign objects, including errant pedestrians. Seating for seven or eight can be arranged, depending upon your selection of a second-row bench or captain chairs. Second-row legroom is expansive, nearly 42 inches, and best-in-class. Third-row guests are a bit less fortunate in the legroom available but it's still enough for average-sized adults, and forward vision is good, provided second-row headrests are lowered. Passengers in this row also receive curtain air bags and their own audio speakers and amplifier for the rear entertainment system. The 8-inch-wide LCD screen is one-inch larger for 2008 and a Bluetooth hands-free phone system is also standard. The QX56 is a big vehicle, 207 inches long, 79.5 inches wide, and storage space isn't difficult to find. With the 2nd and 3rd row seats folded flat, 97.1 cubic feet of cargo room is available. Power comes from a 320-hp 5.6-liter DOHC V-8, that also produces 393 lb-ft of torque at 3400 rpm with nearly 90 percent of that available below 2500. A tow/haul mode for the 5-speed automatic hangs on to lower gears longer and varies converter lockup to help with towing chores. Maximum towing is rated at 9000 pounds for the 2WD model, 8900 pounds for the 4x4. The latter has a part-time transfer case with a 2.57 low range and runs in rear-wheel-drive mode until slip at the front is detected, Up to 50 percent of the power then is routed to the front axle. On the road, the QX56 interior remains hushed at highway speeds with good NVH control. The soft all-wheel independent suspension does an effective job of filtering out most unpleasantness but sharp impacts transmit shudders right up the column and into the steering wheel where they do a Magic Fingers massage on the hands. The steering is the usual numb, lifeless variety to be expected on big luxury SUVs, more a product of the tires than of the steering gear itself. This demands constant corrections to maintain course and a long highway trip in stiff crosswinds can be wearing. Performance remains class-competitive although most of the others now boast 6-speed automatics and engines with variable valve timing, cylinder deactivation and more power, sometimes all of these features. New entries from GM, for example, offer as much as 403 hp and 416 pound-feet of torque and can blow the Infiniti into the weeds. But most owners will never notice, being that they're moving at slow speeds on city streets. 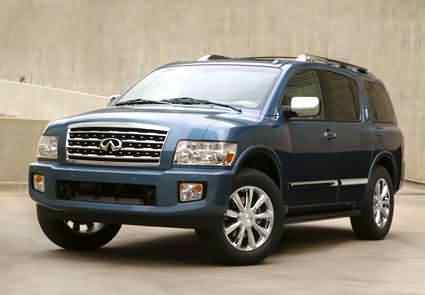 And that's the mission of a rolling fashion statement like this attractive Infiniti QX56. Its job is pamper the occupants and impress the neighbors while it battles for market share with other 13 mpg super-dreadnoughts. Sure, a Nissan Quest has a longer wheelbase, far more usable interior space and gets about twice the fuel mileage. But it won't tow an 18-foot Wellcraft or slog through knee-deep creeks while keeping your Guccis dry.